What happens when you fall for the perfect guy...twice...in one day? But Saxon is a proud player who makes it clear that he doesn't know why he can't get Brenna off of his mind and out of his system, and Jake's sweet and humble attitude hides a secret past life that might be darker and more complex than Brenna is willing to deal with. 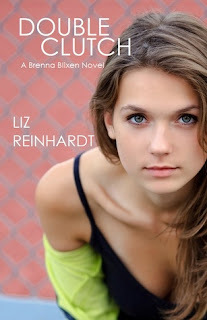 Between keeping the peace with her lovingly over-protective parents, designing t-shirts for her high school's rising punk band, keeping up her grades in classes split between academic and technical high school, and running the track like a maniac, Brenna has enough to worry about without juggling two guys who make her heart thud and drive her crazy all at once. She has to make a choice, but how is she supposed to do that when giving her heart to one of them might mean breaking the other's? My thoughts before reading; This was a recommendation by a book group friend. The never seem to let me down so here goes nothing!! !